My husband and I fostered Bobb after he was rescued by Synergy. We fell in love with him and his indomitable spirit. After moving out of state we made the adoption official at the end of June when Synergy director Carla flew with Bobb to bring him to us. Bobb joined our family of two Siberian Huskies and two cats. On January 22nd, 2015 I received an email from Synergy animal rescue. Synergy specializes in helping special needs dogs, especially seniors, in southern California. Their motto is, “Love to the forgotten; comfort to the sick; care for the blind, deaf and dying.” Their mission is incredible and so worthy, as are the dogs they care for. 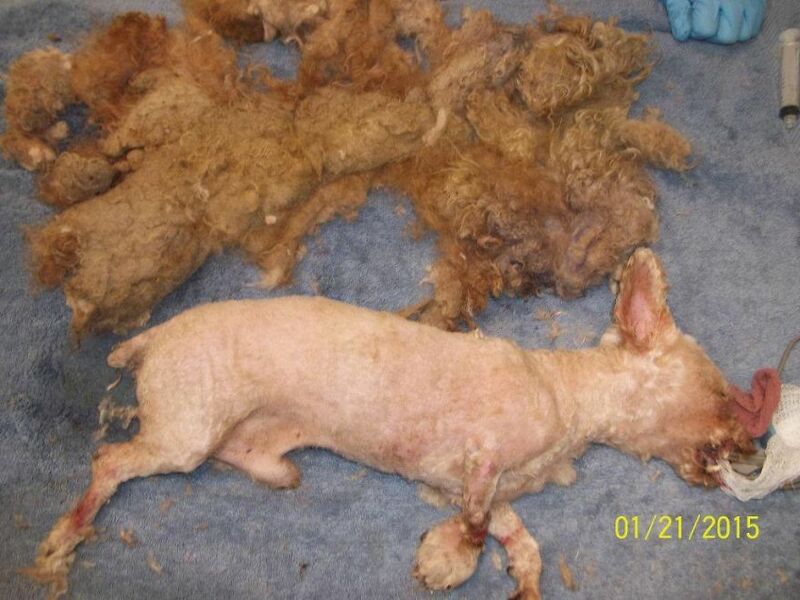 In the email, I was told about a senior toy poodle who had experienced horrific neglect and his tightly matted fur had become so extreme that it had self-amputated two of his legs. 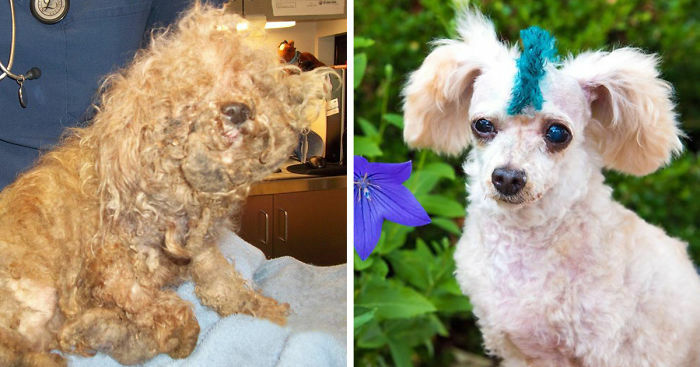 He had been owned by homeless people who hadn’t ever groomed him (we don’t know much about them, but we hope they are getting help too). 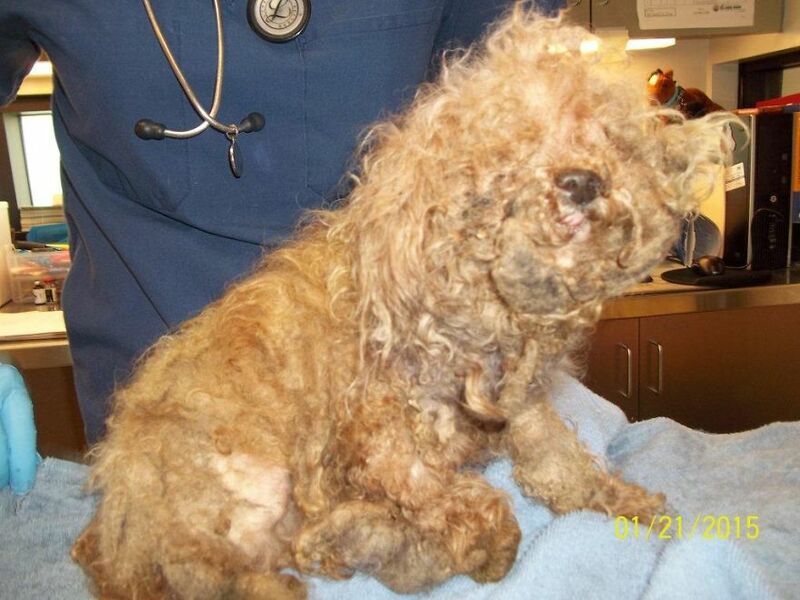 Normally poodles need grooming every 4-6 weeks and this dog had gone 10 years without a haircut. Bobb lost his front right leg just above his paw, his back left leg just below his knee, and also had most of his teeth pulled as they were rotting. We told Synergy that we were interested in fostering him. The Synergy rescue director, Carla, named him Amaze-Bobb. I picked him up on February 2nd. Bobb spent a week with us, as well as our two Siberian huskies and two cats. We gave him a calm place to rest, recover, and be loved and spoiled. Then we got him back for another week. His fur was already growing back in nicely! 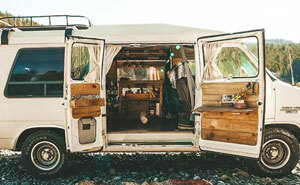 My husband and I had fallen in love with Bobb but we were getting ready to move to Colorado. Bobb went back to Carla. We visited them a few times and talked to her about how we wished we could adopt him. She said we’d work something out, and the excitement began. Carla kept Bobb during our moving process and settling in. During that time with her, Bobb continued to heal and recover. He began to play, run, and was well on his way to a full recovery. He visited people with special needs to spread his message of strength, love, compassion, and understanding. Bobb was also set to visit kids at the child oncology clinic but then became suddenly ill himself. 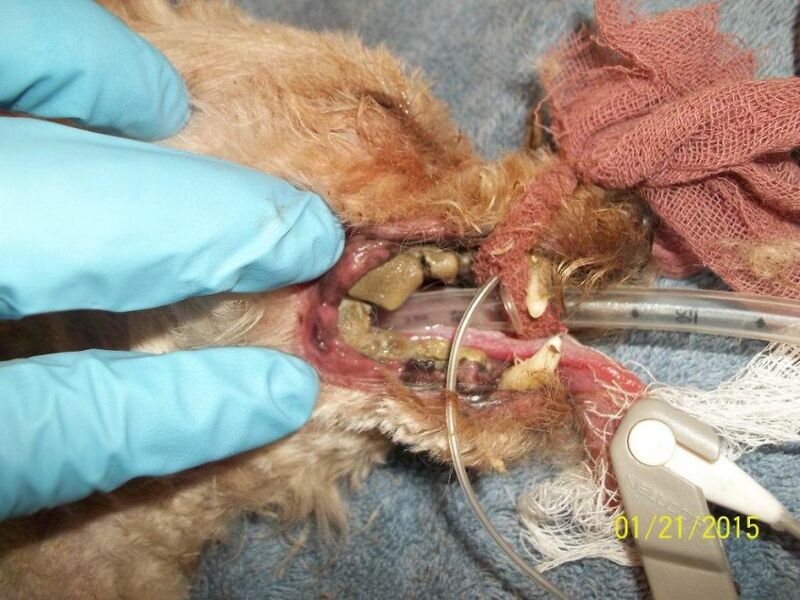 He spent several weeks at the vet as they ran tests and discovered a large infected abscess in his mouth. For a while we thought it may be the end of Bobb’s journey, but thankfully he is a fighter and refused to give in. He made a full recovery, though he did lose even more of his teeth. The day finally came on June 29th. Carla flew from San Diego to Denver with Bobb. It is always hard when a dog leaves to go to their forever home, but by us adopting Bobb it allows Carla to have room to save another dog. We are fully committed to Bobb’s care and quality of life so looked into getting prosthetics for his front and back nubs from OrthoPets in Denver, CO. Unfortunately, it doesn’t seem to be possible as a prosthesis would cause him pain. His back left knee dislocates so he would first need surgery and recovery to even consider it and that’s not something we want to put him through. He did go through an in-depth analysis and even had his front nub casted but the expert team was very reluctant to move forward, giving him only a 25% chance of success but a significant risk of it being uncomfortable or painful due to the shape of his leg- also there is simply not enough leg to attach a prosthesis to. Thank you Dr. Dusty of OrthoPets! I’m a professional dog trainer and I work with him almost every day, at his own pace with lots of treats, to get him used to grooming. His very first visit was to trim his nails and trim his fuzzy Hobbit feet, and a little on his face. For some it is hard to understand why the time and resources would be used on a senior dog with 2 legs. Let me tell you, Bobb doesn’t deserve to be euthanized because he is old and was neglected so severely. He did have a miserable existence but that is behind him now. Special thanks to Jaala at A Cut Above for doing such a fantastic job grooming him gently and with patience! Bobb plays every day. Bobb goes on short walks. Bobb runs, and quite fast considering. Bobb is not in pain. Bobb is happy. Bobb loves dinner time. Bobb loves belly rubs. Bobb doesn’t feel sorry himself, and neither do we. 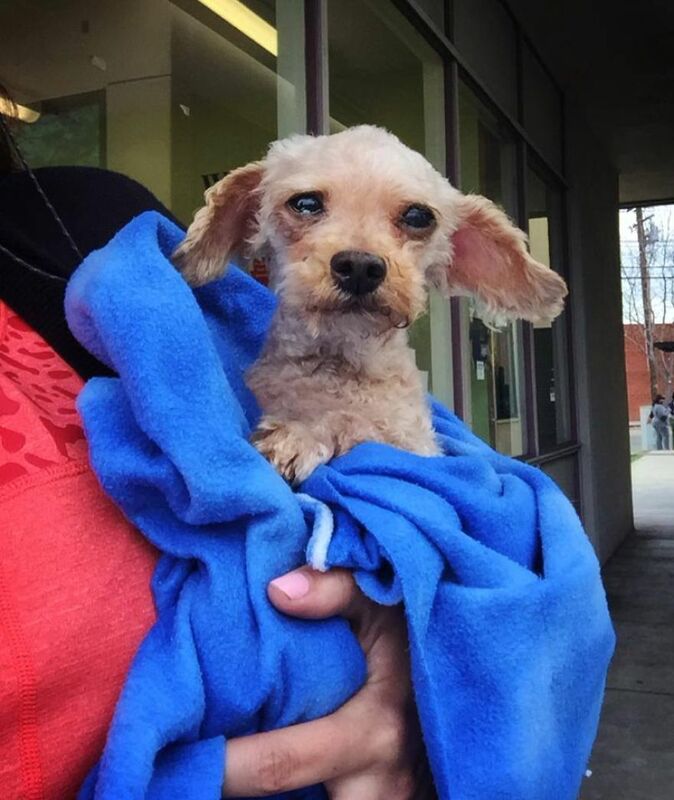 Bobb, and dogs like him, deserve a second chance and to know what love is and how good life can be. Bobb is looking forward, not dwelling on his past. He does some things a little differently, has some limitations, and needs help with some things, but when you look at him you don’t feel sorry for him. even though you can't see it, I'm giving all of you a standing ovation. Bravo for a wonderful story! Thank you for this incredible story. Have a good and long life Bobb!